All eyes will be on the Bombers as they take part in a number of brilliant blockbusters in 2019. The Bombers are set to light up the big stage in 2019, featuring in a combined seven Thursday and Friday night games following the release of the AFL fixture this morning. Strengthening its commitment to the north-west corridor of Melbourne, the Essendon Football Club will for the first time appear in the Good Friday twilight timeslot against North Melbourne at Marvel Stadium, with the Bombers then hosting the Pies in the annual ANZAC Day blockbuster at the MCG just six days after. Featuring in the Good Friday, ANZAC Day, Dreamtime at the ‘G and Powercor Country Festival blockbusters in the first half of the season, the Bombers will face off in a further four games under Friday night lights against Melbourne (round three), Sydney (round eight), Hawthorn (round 13), and Adelaide (round 18). The Bombers will hit the road to commence their assault on the 2019 Toyota AFL Premiership Season when they meet GWS on Sunday 24 March at 3:20pm, with red and black supporters having their opportunity to attend the club’s first home game in round two against St Kilda in a Saturday twilight clash. Chief Executive Officer Xavier Campbell said the club welcomed the release of the 2019 AFL fixture. “Overall, we are pleased with our commercially strong fixture and our members and supporters will welcome the number of blockbuster games we proudly feature in throughout the first half of our season,” Campbell said. “As such, we believe our members and supporters will take great pride seeing their side in the premium timeslots, and from a broadcast and free-to-air perspective with both the Seven Network and Fox Sports so we think there is good balance. “We have drawn strong home games against our traditional rivals in Collingwood and Carlton at the MCG, as well as a key home game against Hawthorn at Marvel Stadium following our scheduled bye in round 12. “This year we host Collingwood for the annual ANZAC Day blockbuster on Thursday, April 25, at the MCG, and for the first time it will be a great privilege to face North Melbourne for the Good Friday clash at Marvel Stadium, as two clubs throughout the northern corridor of Melbourne raising vital awareness and funds for the annual Good Friday Appeal. “From a team performance perspective, the fixture presents exciting opportunities despite the number of six-day breaks scheduled in the first half of the season, however we will be up for the challenge. “At the biggest venue in Melbourne with a capacity of 100,000, we feel it may have been a missed opportunity to not showcase a traditional Victorian based rivalry in two of our four home games scheduled at the MCG. However, we do thank the league for their willingness to work with the clubs to ensure a relatively balanced fixture. “The financial benefits of this commercially strong fixture will allow for further investment back into our organisation, particularly the football program to ensure our commitment to achieving success. 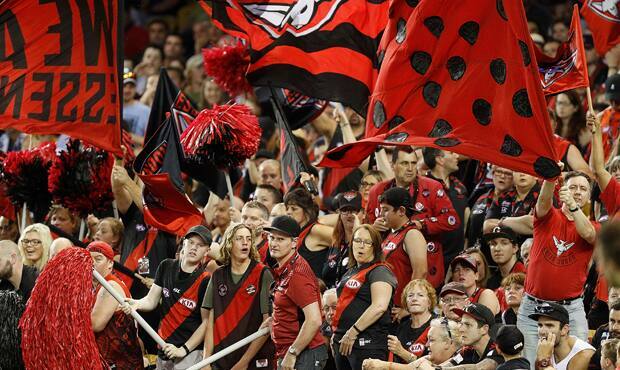 Essendon’s interstate members and supporters are also key beneficiaries of the schedule for 2019, with the Bombers heading to Adelaide, Gold Coast and Sydney and Perth twice respectively. To purchase your 2019 membership today, please CLICK HERE.